On Friday, November 2, 2012, Apple closed down on the day 3.31% at $576.80. This was the lowest closing price for the shares since July 27, 2012 and the shares ended the day and the trading week off more than 18% from the all-time high of $705.07 set on September 21, 2012. For long-term investors, Friday's closing price represents an excellent entry opportunity to realize very strong share price gains in the months ahead while capturing a more than 1.8% annual dividend yield. Apple is currently trading with more than 22% of the share price backed by cash and a price-earnings multiple at the low-end of a nearly three-year trend. The graph below illustrates at Friday's closing price the company's cash and marketable securities per share represented 22.17% of the share price. Meanwhile, the company's price-earnings multiple has fallen to just over 13x trailing 12-month earnings. This is despite 59.5% earnings per share growth in the fiscal year ended September 29, 2012. The high cash per share and very low price-earnings multiple is occurring at the beginning of a six-month period that will deliver record revenue and earnings for the company. Using the first trading day of the month following the release of quarterly earnings since February 1, 2010, Apple's cash per share has continued to rise while the company's price-earnings multiple has continued in a steady decline. From a price-earnings multiple of 20.08 times trailing 12-month earnings on November 1, 2010 to a multiple of 13.06 times trailing twelve-month earnings on November 2, 2012, Apple's multiple has fallen about 35% while cash per share has risen about 133% percent. Since February 1, 2010, Apple's trailing 12-month earnings per share has risen over 331% while the share price has advanced by only 196% over this thirty-three month period. Not only will Apple's share price retrace to new highs over the next six months, investors will be rewarded with a quarterly dividend of $2.65 per share and the prospect of significant additional appreciation while the shares maintain a conservative earnings multiple. Last week I published an article titled, View Apple By Seasons, Not By Quarters. Apple is emerging from a six-month season of lowered rates of revenue and earnings growth and is beginning a six-month season of record results. The recent downward pressure on the share price is occurring in part due to the company's modest rates of revenue and earnings growth in the six-month season ended September 29, 2012. The period included the company's 3rd and 4th quarters of FY2012. The chart below illustrates the dramatic drop in Apple's net income as a percentage of revenue over the two most recent fiscal quarters. Apple's net income as a percentage of revenue reached a high of 29.66% in the company's 2nd fiscal quarter. This occurred as Apple backfilled December iPhone 4S orders and shipped large quantities of handsets into the Asia-Pacific region, including shipments to China Unicom. At that time, China Unicom was the only authorized iPhone carrier on China's mainland. As iPhone 4S shipments peaked early in the March quarter, so did Apple's net income per revenue dollar. Impacting the company's net income performance was the accelerated recognition of foreign-exchange related losses that delivered an OI&E loss in the September quarter. For the current quarter, management is guiding to an OI&E contribution of $380 million to the company's pre-tax income line. Contributing to the drop in net income as a percentage of revenue over the most recent two fiscal quarters was a drop in gross margin as the iPhone 4S delivered a smaller percentage of the company's overall revenue and demand began to build for the successor flagship handset. From a high of 47.37% in FQ2, gross margin fell to 40.04% in the company's 4th fiscal quarter. Although the iPhone 4S delivered extraordinarily high gross margin, unit sales peaked four months after introduction. No matter the drop off in gross margin in the latter six months of the fiscal year, Apple delivered average gross margin of 43.87% in FY2012 versus 40.48% in FY2011 and 39.38% in FY2010. Apple begins the new fiscal year with multiple product transitions and the introduction of the iPad mini. During the September quarter conference call with analysts, Apple CFO Peter Oppenheimer said the new products begin at the height of the manufacturing cost curve. Higher costs include the amortization of manufacturing equipment that do not add to the incremental costs of each additional unit made. Apple has chosen to refresh multiple products simultaneously to take advantage of holiday season sales and maintain the company's technological advantages across product lines. Net income per revenue dollar will improve significantly as Apple moves through the fiscal year and economies of scale begin to reduce the reported costs of each additional unit sold. The graph below illustrates Apple's segment revenue mix in the fiscal year ended in September. Combined, the iPhone and iPad product lines delivered about 72% of recognized revenue in the twelve-month period. In FY2013, I anticipate combined revenue from iPhone and iPad unit sales will approach 80% of the company's reported revenue. Apple's net income performance per revenue dollar will begin to improve in the December quarter and continue to improve sequentially through the March quarter. On a year-over-year basis, net income per revenue dollar will improve in the latter six months of the current fiscal year and throughout the first half of FY2014. Apple manages for long-term growth and maintains a constant cycle of product enhancement and product innovation. This approach will deliver record revenue and earnings in the current fiscal year and for the foreseeable future. The graph below illustrates the fast rate of combined iPhone and iPad unit sales. In FY2012, Apple shipped over 183 million iPhone and iPad units. In FY2013, the two product lines will deliver about 80% of Apple's reported revenue and deliver a recovery on a sequential basis of net income per revenue dollar through the March quarter with significant improvement in the year-over-year net income per revenue dollar in the subsequent four fiscal quarters. The iPhone 5 will be at the height of its manufacturing cost curve during the December quarter. The high upfront manufacturing costs to produce the new series of handsets is due to product design innovations that will benefit unit sales through the life of the iPhone 5 series of handsets. In FY2012, Apple delivered revenue growth of 44.6% to 156.508 billion. For FY2013, I am modeling revenue growth of about 42% to deliver reported revenue of over $222 billion dollars. Below I detail my revenue expectations for each of Apple's major product lines. In FY2012, Apple sold over 125 million iPhone handsets. At the introduction of the iPhone 5 in September, Apple began offering the iPhone 4 at a $0 post-subsidy price on AT&T, Sprint and Verizon. This is the first time Apple has a $0 post-subsidy handset available on the three national domestic carriers authorized to sell the popular line of smartphones. Last fiscal year the iPhone 3GS at $0/$.99 was available through AT&T only. Apple exited last fiscal year's December quarter with a significant backlog of iPhone 4S orders and delivered insufficient supplies of the handset to China Unicom just prior to regional Lunar New Year celebrations. The addition of China Telecom as an authorized iPhone carrier on China's mainland occurred in March. I expect a simultaneous launch of the iPhone 5 through China Unicom and China Telecom well in advance of the regional Lunar New Year celebrations. Although the iPhone 5 is currently in a state of constrained supply, the addition of new carriers, enhancements inherent in the new product's design and Apple's ability to scale manufacturing to meet global demand will deliver sales of about 200 million units this fiscal year. In October, Apple introduced the iPad mini at an entry-level price of $329 for the new line. Although the company received criticism for the $329 price, Apple has placed a price ceiling on the market for smaller tablets and the price provides the opportunity for Apple to sustain adequate margin as the new line of tablets is enhanced with additional features. I expect a major refresh of the iPad mini line within the current fiscal year and I expect the refresh to include an upgrade to what Apple calls its Retina display. In FY2012, Apple sold over 58 million iPads. In the current fiscal year I expect iPad unit sales, inclusive of the iPad mini to generate sales of over 100 million units. Combined, Apple will sell 300 million iPhone and iPad units this fiscal year, representing a greater than 60% year-over-year unit sales growth performance. In FY2012, the iPad line delivered 57.21% revenue growth on an 80% rise in unit sales. The iPad mini will reduce average revenue per iPad unit sold this fiscal year, but the opportunity the iPad mini provides to expand Apple's customer base is an attractive one for long-term growth. Combined, I expect the iPhone and iPad product lines to deliver over $175 billion in revenue, representing roughly 80% of the fiscal year's total. The Mac's success is not determined solely by the number of units sold. It's also determined by the extent the product line increases revenue and yield per customer. On average, each Mac sold has about twice the revenue weight of an iPhone sold and more than twice the revenue weight of an iPad. It's no coincidence about 50% of Macs sold through Apple's global retail store network are to customers new to the platform. The Mac's unit sales performance is inextricably tied to growth in the number of retail stores outside the US and Apple's expanding base of iPhone and iPad owners. The global PC market is in a state of economic decline. Apple's ability to increase Mac unit sales as global PC sales decline is indicative of the "Apple product mutual halo effect." In FY2013, I expect the Mac to deliver about a 5% increase in unit sales against a backdrop of a global PC industry in economic decline. 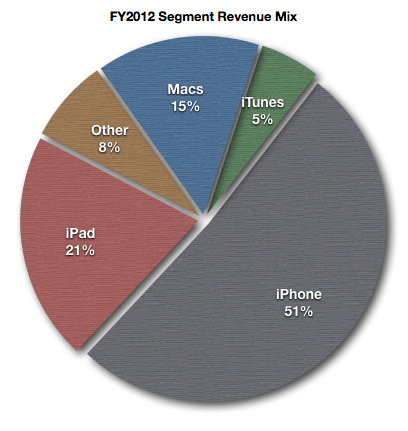 In FY2012, the Mac represented about 15% of Apple's reported revenue. In FY2013, I expect the Mac's revenue contribution to fall to just over 10% of Apple's reported revenue total. In FY2012, the revenue segment inclusive of iTunes delivered revenue growth of about 35%. In FY2013, this revenue segment will deliver more revenue in each fiscal quarter than the fading iPod line of products. More than the maker of separate digital device product lines, Apple has become a global eco-system incorporating digital devices, a worldwide network of retail stores and online distribution of software, digital device apps and content. In FY2013, iTunes may reach a base of one-half billion customers with accounts backed by credit cards. Long-term, Apple's rates of growth will be determined more by the continuing development of the company's broad eco-system and customer base than the success of any one of the company's major product lines. During the September quarter conference call with analysts, Apple CEO Tim Cook noted the high percentage of customers that own multiple Apple-branded devices. I expect the revenue segment inclusive of iTunes to generate more than $11.5 billion in reported revenue and represent no less than 5% of the company's revenue total through rising sales of apps and content to a fast-growing number of active product users. Apple will deliver strong rates of revenue growth through FY2013 and will sustain strong rates of revenue growth through at least the first half of the following fiscal year. Apple's net income per revenue dollar will improve over the next six fiscal quarters as the high costs of the iPhone 5 series transition are amortized over a rising number of units sold and as Apple expands production of the iPad lines inclusive of the new iPad mini. In an era of financial uncertainty and volatile equity markets, Apple will continue to deliver strong revenue growth and an improving net income per revenue dollar performance in the wake of the recent April through September slower-growth revenue and earning season. For long-term investors, following Apple's road paved with earnings gold will provide very attractive share price gains over the next six months with a modicum of current dividend income as a reward for patience and foresight.